Please refer to our stock # 3219 when inquiring. 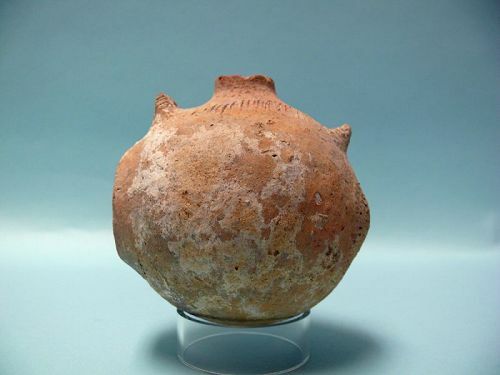 Early Bronze Age II Terracotta Miniature Butter churn, Levant area ca. 3150 - 2850 BCE. 4 3/4" x 4 3/4" xs 4 1/4". With loop handles and incisions encircling mouth and handles. Intact and in excellent condition as seen in images. Ex: Arieh Klein, Jerusalem. According to the Jewish Virtual Library,proper urbanism is characteristic of the second stage of the Early Bronze II (3100–2700 B.C.E.) with the emergence of full-fledged towns with fortifications and city gates, distinct built-up areas set aside for housing, industrial, and mercantile activities, administrative buildings/palaces, temples, and public water systems. The reasons for the development of urbanism at this point in time in the southern Levant are unclear. However, towns are much larger and denser than the previous settlements of the EB I and they appear to have had much more control over their hinterland. The overall numberof EB II settlements in the landscapes of Palestine decreased, suggesting a movement of population into the towns. This ultimately led to a differentiation emerging between the status and function of individual villages of different sizes and their interdependence as satellites of the larger dominating towns. Fortifications from the EB II are known from Tell el-Farah (N), Beth Yerah, Aphek, Ai, and Arad. Administrative buildings/palaces have been unearthed at Megiddo and Arad. Temples have been found at Beth Yerah, Megiddo, Ai, and Arad. Arad is a good example of a large fortified town in the eastern Negev Desert. It was a well-planned city, divided into distinct neighborhoods of houses by streets, with shrines (one with a stele depicting deities with upraised arms), public or palace buildings, a water system (more than 15 meters deep), and it was surrounded by a massive fortification wall with projecting semicircular towers. The houses were of distinctive broadroom plan (hence the "Arad house") with the entrance in the long wall. The pottery assemblage from the site includes vessels imported from Egypt, as well as a large quantity of painted and well-burnished local wares that hitherto had been found in quantity in First Dynasty tombs at Abydos. A jar fragment with the serekh of Narmer, founder of the First Dynasty of Egypt, provides important synchronism between Egypt and EB II "Canaanite" Palestine. It is believed that the flourishing of EB II sites in the Negev and Sinai was the direct result of the copper trade controlled by Arad. At the end of this period some towns were abandoned: Tell el-Farah (N), Aphek, and Arad.